eSchola 2003 - How we did it..
For 5 days in December 2002 pupils from Amot secondary school covered with text, pictures and streaming video events in connection with all the arrangements when former President of The United States, Jimmy Carter, received the Nobel Peace Prize. The pupils met Carter and world known artists like Santana and Willie Nelson. They wrote about these meetings and published articles on Internet with many photographs and streaming video from the events. For weeks before the departure from our small society Rena, 180 km from Oslo, the pupils had to study the Carters political career and the work for peace this still very active, remarkable man (78) is doing. together with the Major of Oslo, Per Ditlev Simonsen. For 5 years pupils from Amot secondary schools have had the editorial responsibility for the nationally based Internet paper called The Youth Paper (Ungdomsavisa) in December. Each month a new school takes over the editorial responsibility for the paper. December month is in Europe connected with Christmas, but in Norway the month is also in Norwegian mass media, connected with the Nobel Prize Ceremony in Oslo. Off course, mass media reporters from other countries are also coming to Oslo in hundreds. In addition to the Ceremony, many important political meetings take place and world known artists are singing and playing at the Noble concert broadcasted over television to countries all over the world. Like real journalists the students have been accredited by the Norwegian Ministry of Foreign Affairs. The students take part at the press conference with the winner of the prize, the Noble prize ceremony, press conference with world known artists and political meetings. Shortly one may say that the students come close to leading politicians and world known artists. And as the pictures and video show – these politicians and artists take the students serious. They answer questions and are willing to be exclusively photographed. 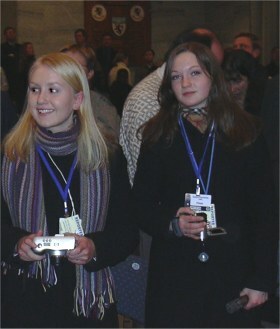 Accredited: Two of our students. The project is integrated into the Norwegian curriculum and we hope that our coverage of the Nobel Prize arrangements at this web site can be a little contribution for peace, international cooperation and understanding of the importance of the Nobel Prize among school pupils and others. We will try to show that students and teachers now live in a world which gives them unique new possibilities. Internet has changed the world and the schools. New technology is transforming the schools and has in many cases necessitated rethinking of traditional pedagogical practices. The technological development and Internet have given schools in Europe the possibility to develop new teaching practices in order to engage, motivate and inspire young students. The pupils take the train to Oslo and are living at a hotel. They begin immediately to work when they come to the capital Oslo. This seems of course simple, but before the arrangements very much work has been done. Over years the school has established partnership and contacts with the press department of The Norwegian Ministry of Foreign Affairs, members of the Nobel committee, the Nobel Institute, well-known Norwegian politicians and others. We have got help from private persons, parents, public organizations and private firms. Establishing private/public partnership has been very important for the project. In the project the pupils work in a real world setting just like a modern net based paper. The articles must be delivered with strict consideration to dead line, photos must be made ready and video edited and saved in the right streaming format. Teachers must give feedback to students and action must be taken whenever new situations meet pupils. 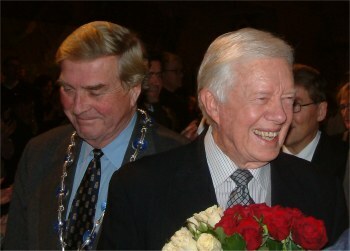 Suddenly they met Jimmy Carter with family at the main street, Karl Johan, in Oslo for example. Actions had to be taken immediately. 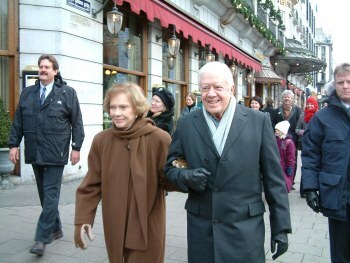 Jimmy Carter and his wife walks the main street of Oslo, Karl Johan. In a way, this is a new way of learning, giving students the possibility to publish articles on Internet which could have been made by professionals, but are made of school pupils. Especially digital video gives them the potential to make a significant contribution to our culture in documenting important political events but also everyday life. Through broadband and digital video students will also be in a uniquely powerful position - creating, receiving and editing digital video live on the net. Through this schools can also build up important media libraries. And may be this is just the beginning. Will digital video transform the nature of education and our schools? The streaming videos are published in 3 qualities and the highest quality is 550 kbps. In the future when high speed Internet access is more common and speed higher, we want to publish streaming video with higher speed than 550 kbps. One day we hope we can have full screen video, even in high definition. The main html pages for this site are meant for laptops and stationary computers. In addition we have a PDA version. In this version the pictures are smaller and the streaming video is meant for the small screens and published in PDA format. We have chosen also to have a PDA version because the school have a project with pedagogical use of PDA’s and we want to find out more about publishing for small screens.